Here come the fashbots, and this time they might actually be useful. Facebook’s seemingly half-baked chatbot platform soured many on the potential of conversation user interfaces. The first bots built by outside developers back in April were clumsy and more trouble than just using a website. So Facebook’s Creative Shop is getting involved, working with bot creator Msg.ai and the Tommy Hilfiger fashion brand to make a flagship chatbot worthy to point to. The TMY.GRL A.I. Messenger Bot will promote today’s debut of Tommy’s capsule fashion line for supermodel and social media star Gigi Hadid. 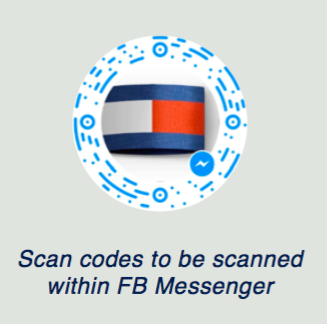 People can discover it by tapping the message button on Tommy’s Facebook page or posts, opening a shortlink URL or scanning its Messenger QR code. Through the bot, fashionistas can type questions or select pre-made queries to learn about Gigi, see behind-the-scenes content from the collection’s runway show event and, most importantly, shop for items from the nautical-themed clothing line. Facebook still hasn’t built a native checkout and payment flow into its Messenger bot platform. Shoppers will be linked out to Tommy Hilfiger’s website to put in their credit card details and confirm purchases. While that might give brands a deeper sense of control over the experience, it likely also reduces conversion rates as leaving Messenger gives them a chance to get distracted or reconsider buying something. It’s something Facebook will hopefully build soon. Puneet Mehta, CEO of Msg.ai, explains that consumer goods companies are attracted to bots because of “the relationship aspect, not just sales.” If they can create a memorable, interactive experience with their brand instead of just one-way marketing, customers will keep coming back. That’s why Facebook’s marketing experts from its Creative Shop, which typically help out advertisers, got their hands dirty on developing this bot. But now he feels that by relying on a dependable company like Facebook, there’s less to worry about and more to gain as customers embrace new ways to shop. Tommy Hilfiger CMO Avery Baker tells me that “one of the things that’s always been important in fashion is customer service and the experience in a store.” The TMY.GRL A.I. Messenger Bot will try to answer people’s questions and offer a more immersive, responsive feel than shoppers usually get online. The bot will try to capture some of the personality of talking to Gigi herself, while remaining transparent that there’s not a human on the other end. “No one wants to feel like they’re being spoken to by the corporate animal,” Baker admits. Fashion still seems like an unlikely candidate for chatbot success. People can’t touch or try on the clothes, and the bot doesn’t know enough about the user’s style to make smart recommendations about which items they might prefer. But Hilfiger believes this brand-specific bot could perform better than multi-brand retail shopping bots like Spring, which launched with the Messenger bot platform and was quickly proven confusing and unconvincing. At the very least, Tommy Hilfiger could use the campaign to lure people into messaging their bot first. That’s critical, since Facebook Messenger only lets brands message people who’ve already pinged them. Getting conversations started is essentially the new version of getting people to Like your Facebook Page. Better to build an audience early than get left behind.